When the button on my Nike Fuelband broke, I eventually decided to get a Pebble and run the Misfit app on it to track steps. I've also loaded Tetris onto it and the Swarm check-in app. I also get notifications from my phone, via bluetooth. Here's a tutorial: Getting started. 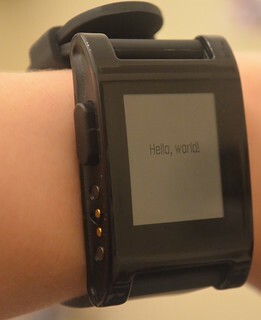 Ooh, interesting, will be having a peek at that (not that I'm about to write anything momentous for the Pebble, but just to have a play when I get time). Thus far, enjoying my pebble... I'm sure you'll get a lot more out of it, though -have fun! Do you use the Misfit app? One night it thought I slept for 8.5 hours and walked 20,000 steps at the same time.. Perhaps I was sleepwalking? But that aside, the step count / points count seems quite inaccurate and for me does not seem to match their indications of what would be required to get the step counts. I guess I had got used to the Nike Fuelband, so perhaps it will just take me time to get used to this. I do use the Misfit App but only for the sleep hours, which does seem to work.. most of the time, except that about once every two weeks or so it decides that I slept 0 hours so I find it has disconnected itself. Other than that, sleep monitor seems to be fairly accurate. Steps is another matter and I have now given up on Misfit for that and use Movable which seems to be a little more accurate. Both of them can be synced with Android or iOS (iPhone 6 here; I have a Nexus 5 but the Pebble is connected to the iPhone) and Movable claims that allowing the phone instead of the watch to record steps is more accurate but I have found otherwise here -it seems to clock double the number of steps if I do, so the watch does it. Ah, perhaps I should give Movable a go then. Thanks for the suggestion!